KARACHI, December 19: The Office of Global Engagement at Habib University makes tremendous efforts to ensure Habib University’s learning experience is inspired by global standards. With the former MIT Dean Deborah Fitzgerald visiting the university just last month, expectations were high this time around too, and many students and faculty were pleasantly surprised when members from the Stanford University’s Design School came to visit. Sarah Stein Greenberg, Executive Director at the d. School of Stanford University spent three days at Habib University, conducting workshops with students, faculty and staff members that introduced methodologies of design thinking at Habib University. Not only this, she gave a riveting seminar on the importance of continuous learning taught as a design experience at said school to conclude her trip. Moderated by Dr. Anzar Khaliq, Assistant Professor of Physics and Director of Integrated Sciences, the seminar spoke extensively on the integrated approach to learning taught by Ms. Greenberg at the d. School. The d. School had humble beginnings, originating in 2005, as told by Ms. Greenberg. We may have preconceived notions about the school, but fact is, it was founded by an engineering professor at Stanford University, Professor David Kelly, in 2004. Sharing stories of her encounters with design thinking through student projects, as well as her own experience learning at the institute, Ms. Greenberg spoke of the ideology of the institute. She also commented on the standards of education at Habib University. It’s been a pleasure to be here and get to know of such an inspiring and new education model. The students at d. School are encouraged to find lasting solutions to real-world problems, ensuring the focus remains on human interaction and “empathy”. Revealing a five part philosophy that all students follow at the institute, she reflected on how it helped her and other students to develop an environment where the learning approach is truly unique. The traditional approach to education is no longer a viable idea, because the skills needed to tackle the problems of today are not in text books written for societies of old. A culmination of ideas, aesthetics, learning, design process and collaboration is highly encouraged for students at the d. School, presenting a perfect cross roads feeling that offers a rich and dynamic environment. She detailed each of these five aspects with personal stories and interactions, displaying projects, the process of developing them, as well as video clips of success stories having emerged through the d. School, providing solutions in different parts of the world, especially in Asia and Africa. Design is no longer a profession, it is an attitude that was foreshadowed four decades ago by the Bauhaus movement, and we feel it is a perfect culmination of the transformative educational experiences we try to replicate at Stanford University. To give a small example of the adaptive learning experience taught at the institute, Ms. Greenberg led a small exercise during the seminar as well, where each member was asked to draw a quick portrait of their neighbor. Demonstrating that creativity is not defined by ones drawing skills, she reflected on how students are thrust into such tasks where they are encouraged to feel engaged and involved, without embarrassment. You must suspend judgement and reveal your ideas to your end user at an early stage without shame, because the feedback you receive from it will only help you in finding and selecting the right direction. At d. School, we give students a platform to critically define and process ideas in a creative way, without self-censor. 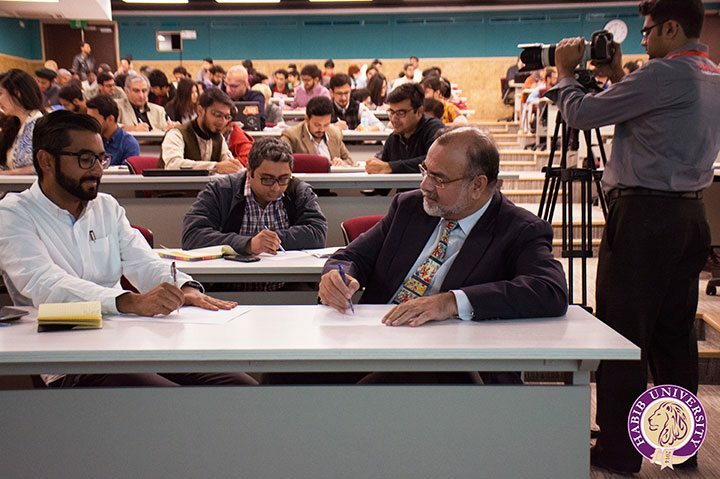 The exciting seminar preceded two days of workshops with faculty, students and university staff. The workshops were designed to help the HU community understand the approach to design as a learning experience, the workshops were a great success at helping the community expand their horizons in terms of collaborative effort, empathy as a solution to problems, and creativity even in the most analytical situations.